We will now compare the results from the traditional Artemisia / Yarrow method to obtain the two I Ching oracle trigrams as explain by Richard Wilhelm in his The I Ching: The book of changes with those from the simplified coin version described in the same book. Every hexagram has a meaning and if it contains Old Yang or Old Yin lines which meaning is extended by the I Ching with further advises. In this case, the Old Yin / Yang extension is done evenly with the same probability (2/16) when using three coins. This ancient method consists in dividing three times into two groups a set of 50 stems of Artemisia or Yarrow. At each division a calculation is done, a number of stems are left out and the process is repeated. For a complete human language explanation of the process I highly recommend you Mr. Richard Wilhelm translation of the I Ching, but next you can see this process in the more precise and concise R language. The previous R function returns six Yin Yang elements coded from 6 to 9 following the traditional method to obtain I Ching hexagrams as explained by Richard Wilhelm. So both methods return equal probabilities for each hexagram since we have a 50/50 chance to have a Yin or a Yang sign, but we don’t have the same probabilities for their interpretations. The traditional method clearly favors Yang interpretations of the hexagrams which makes the coin procedure a bad alternative for an accurate reading of the I Ching as intended by they ancient Chinese who developed the method and, if we consider how this book is being use all over the world, it might not be a bad idea to stop using the three coins procedure in favor of the traditional one since the later promotes more positive and active interpretations of the hexagrams. Now, I wondered a number of questions about why this procedure is the way it is, so unless some sinologist in the room says otherwise I am going to make some “common sense” assumptions. Why the use of stems instead wood sticks? The use of stems instead straight wood sticks might be due to avoid getting a feeling of the sticks and getting always a desired result (similar to what might happen with a deck of cards). the gnarled stems with its different widths help to prevent such bias and increase the randomness of the process. Why 50 stems of Artemisia / Yarrow? why 50 stems when the first step is to discard one? Well it could be magical reasons but it could also be an algorithmic left over reason since, at each of the three divisions, one stem is discarded. Another reason could be that it also increases the randomness of the process; by discarding a different stem each time it becomes more difficult to get a “feeling” of the stems and unconsciously obtain desired results. I would say it has to do with numerology, the proportions for Yin and Yang signs yield by the algorithm are represented by the first four prime numbers, that is, 1, 3, 5 and 7. Ancient Chinese might have noticed that 1+7 = 5+3 and associate this mathematical property with the Yin and Yang equilibrium in the universe. Once this is set the probabilities for the Old Yang and Old Yin are also set and they decided for a higher degree of action among those using the I Ching. Why 3 COINS as alternative? Obviously the Artemisia / Yarrow process is overly complicated, but I don’t know why the alternative chosen to simplify the process were the three coins version since they clearly change the I Ching oracles. Did those developing the alternative knew what they were doing? Was is just a way for lay people to use the book without much hassle and they did not care? Any sinologist comment is more than welcome! This is my favorite alternative both, for its simplicity and its beauty. For this alternative we simply need to first toss a coin; if we have tails (0) that means Yin, if we have heads (1) that means Yang. Which means that when having a Yin result, a result of 1 with the die will make it Old Yin, and when having a Yang result, a result of 1,2 or 3 will make it Old Yang. Toss the coin and set it free. Old Yan3 as much as three. Now we simply have to throw the die six times, build the hexagram from bottom up and that’s it, enjoy your traditional I Ching oracle hexagram! One simple way to do so would be to use a 16 side die and then associate its side numbers as follow. Another perhaps more aesthetically pleasant distribution of numbers would be to place all the Yin possibilities (1 + 7) at the top of the bi-pyramid and all the Yang (5 + 3) a the bottom. Looking for dices I found an amazing web page where we can buy dices, coins and many other beautiful designs thanks to the magic of 3D printers. Just for you to know. I would like to thank all the kind and insightful comments on this post, I do truly appreciate it. A few of you also shared alternative methods to the Artemisa/Yarrow method that also maintain the right probabilities, thank you very much for sharing. I thought about updating this section with your kind contributions and give you due credit. However, I find more efficient just to recommend here to the visitors to check the comment section below for these alternatives -which are many and very creative! yes, i was about to say the same thing! very well done! Very interesting article which has inspired me to try the yarrow stalk method. Thank you. Wow fascinating exhaustive article, bookmarked for future reference. I have used the I Ching several times in the past and even have a (don’t laugh) I Ching app on my iphone! Probabilities is maybe too much coincidental outcome versus magical existence.. I did the same-bookmarked it. A worth-reading post. I never thought of the probability associated with each “yao” or “yiao.” (http://www.nationsonline.org/oneworld/Chinese_Customs/bagua.htm)! I am not sure what the Artemisia method is. However, I’ve derived a different probability distribution for the yarrow method described here – http://www.eheart.com/yarrow/use.html. The probability of getting 4 or 8 on the second and third “changes” is not 1/2. I might be wrong. I need to double check my reasoning later. The Yarrow method uses Achillea millefolium, Richard Wilhelm translation mentions Achillea and Artemisia, so basically it is the same traditional method using different stems. Maye I should update the post with both kind of stems, thanks for mentioning. The link at eheart basically describes the same method found in Richard Wilhelm translation, they also realized that the probability of getting a changing yin line (Old Yin in Whilhem translation) is smaller but they don’t go further. About you having different probabilities, in the post I mentionted. So it is not exactly 1/2, maybe this is why you have different results? 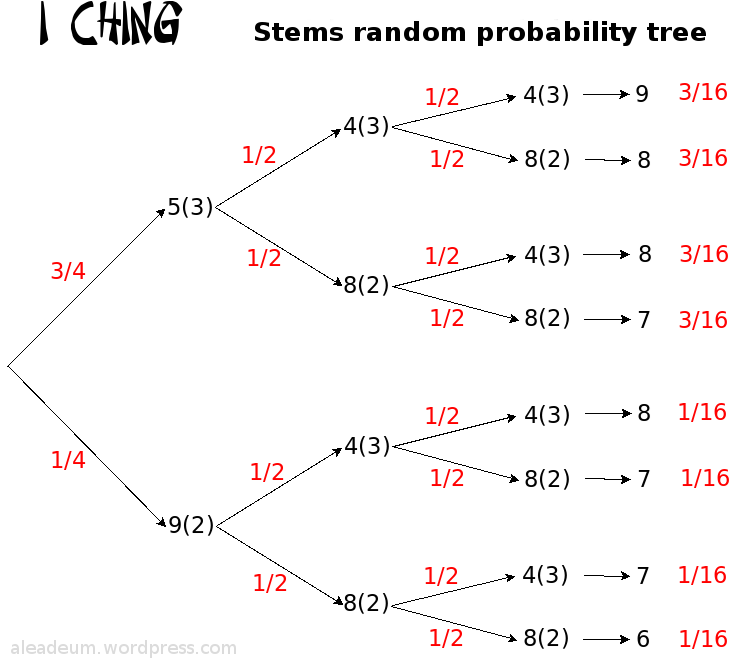 but if you think about the procedure I would say it is quite obvious that 1/2 was the intention, in fact, if the number of stems grows to infinity the bias disappears and the probability converges to 1/2. I did not calculate it but perhaps there is a larger number of stems that would remove the tiny bias without going to infinity? In any case ancient Chinese probably considered practical issues and thought that 50 stems was a good enough approximation. After the first “change,” there will be 40 or 44 sticks left. Removing one stick from one of the piles, there are, e.g., 39 left altogether. The possible remainder combinations are (1,2), (2,1), (3, 4) and (4,3). I made a mistake thin inking the third possibility as (3, 0), temporarily forgetting that four sticks are set aside when the remainder is zero in this case. Anyway, yes, if we write out all possible ways of dividing the sticks, the probabilities are not exactly 3/4-1/4 and 1/2-1/2. The link to Leibniz takes one to Jung. Minor error. Enjoyed your post. I use a simple method to maintain the probabilities. Pick them one at a time and return to dish and pick the next etc etc. for the 6 lines. You can of course vary the colours provided you keep to the ratios. That one works too! Thanks for sharing Michael. I run http://www.iching.pl website based on 3 coin method algoritm. It’s been 9 years and I have collected over 3.000.000 questions and answers in form of 678967. Your article surprised me and I’d like to change my algoritm to yarrow to see how the results will change … thanks for inspiration!!! Oh wow! I am very happy you found my article useful. Thank you very much Wojtek for letting us know! Great article. Where can I get one of those 8 sided dice? Many thanks. Another reference i came up recently since this is part of some studies i do as well, by physicist-biologist S. Petoukhov, which relates the DNA bases and biological symbolic alphabet to the trigrams and hexagrams of the I Ching, and the dualities of Yin/Yang. Quite interesting, and not only for random generation! pairs of “attribute – anti-attribute”). 1) We don’t know for sure what exact yarrow stalk method was used by divination officials in late Shang and Early Zhou times. It is quite possible it was much different then the 12th century Zhu Xi explanation which is official today (please see more about that here: http://www.biroco.com/yijing/prob.htm). 2) It is very likely coin method has been in use much longer and has been used much more frequently than the yarrow stalk method. 3) But the most important question is: does it really matter? I think it does not really matter too much because even though we call it a random selection of the lines/hexagrams the basic idea is that cast hexagram IS NOT RANDOM because it must give meaningful answer to the question asked. Otherwise we would accept basic premise that any given hexagram and any given moving line would equally well “answer” the question. Which I do not believe is true. 4) Probability in favour of more yang lines would not imply inherent logic of Yi Jing oracle is towards action. it just means that one would (on average, when used in the context of large numbers) get more yang moving lines which in turn may mean anything. 5) If you toss a coin 5 million times on average you will get 2.5 million heads and 2.5 million tails however if you flip the coin only one time this coin will act as if no coin was ever flipped before and no coin will be flipped after. In my opinion traditional statistical probabilities make sense only in the context of large numbers. As we know we do not cast Yi Jing hexagrams 5 million times for one question therefore all those probabilities have very relative meaning. 1) Even if we don’t know the original method at least we know that the scholars in the Zhou dynasty decided to hold the yarrow stalk method as official. So we have a chronicle vs a tradition holds, you can make your source choice. What I can believe and I would agree with you is that the average person would not want to use the yarrow stalk for being overly complicated and that they would use the simplest tossing coin procedure. 3) I will disagree on this point with you. It is random, if it wasn’t you would always get the same anagram for the same question which is not the case, or opposite answers for opposite questions which is not the case either. What is not random is our interpretation. 4) Well, again, the Zhou scholars decided that the yarrow stalk procedure was a sound logic for the Oracle, I am not a scholar myself so I can’t really tell otherwise. Also, if the practitioner associates Yang with action and Yin with caution, which I would say is a reasonable association, then yes, having a larger proportion of moving Yang means something in my opinion. 5) The inference process that goes from the general to the particular is called deduction, and this is precisely the inference process Probability Theory is good for. Tossing a coin is one of this particular cases. i think the whole point of the discussion here is whether these probabilities, faithfuly represent the sample space. Based on the analysis by Fran on the yarrow-stalk method vs 3-coins method (or 2-coins method), this would not be so. In other words, the sample space may indeed have more old yin or old yang items than new yin / new yang. This is the whole point, and in this sense the yarrow-stalk method would indeed faithfuly sample and represent the event space, than the other methods. Sorry, minor correction, the rationale of having more new yin / new yang than old yin / old yang, is related to being a faithful reperesentation of the underlying event space. A possible justification for this distribution has to do with the whole theory behind the I Ching and how changes happen and what they represent. instead of 3/16 + 5/16 + 5/16 + 3/16. It may very well be 1/4 + 1/4 + 1/4 + 1/4. The I Ching has a theory behind it which relates trigrams, hexagrams and the like into a representation. Associated to this theory, which we do not know very well (inspite some “new-agers” claiming otherwise), is the method to sample the event space in order to generate hexagrams for a given situation. In this sense and given Fran’s analysis in this post, it is plausible the yarrow-stalk method (given the theory of the I Ching), indeed faithfuly represents and samples the event space. One may choose to sample the event space differently, it does not guarantee faithful sampling though (unbiased sampling if you like), unless one can justify it based on the (theory of the) I Ching itself. And since this theory is not exactly known, one can say that based on the I Ching and the documented yarrow-stalk method, this most probably matches the (largely unknown) theory of the I Ching itself on the event space and how to sample it correctly. Also note that ancient Chinese were very good number-theorists among other things (e.g the chinese remainder theorem), and probably knew enough methods of sampling. Using a method for a specific purpose, should have a meaning (assuming the yarrow-stalk method was indeed used as documented) This was my comment. Additionaly have in mind that the I Ching, like other (sacred) books of the east, has in its writing and content, a codified multiplexed context. This in simple terms means that the same text can represent multiple (note, simultaneously compatible and valid) associations which unfold based on external data and stimuli. This extra data (or decipher code if you like, what i refered to as the theory behind the I Ching in the previous comment) are usualy provided on initiation, which further unlocks the whole meaning that has been codified (if this is the case of course) into the text. So, one thing the article glosses over is that, when taking a reading, you look at your old lines as changing and they flip to the other line. If you have moving lines, the hexagram you pick is supposed to represent the current situation. The moving lines each have an interpretation associated with them that reflects the things changing in the situation and how to get to the solution. This leads to an end-state hexagram that represents where things are going. The yarrow stalk method gives you the same number of ying (passive, feminine, receptive) & yang (active, masculine, creative) lines. This means that the chance of finding a *starting* hexagram to describe the situation is equal. It gives you more old ying lines than old yang lines – lines that flip – so the *ending* situation and the steps to get there favor a more active approach to problems. 1) Even though Yi Jing (as a text and way of thinking) pre-dates yin-yang theory for many years I still believe yin yang paradigm is inseparable from the Yi Jing logic. In this context one can see randomness as yin and deliberate/intentional choice as yang. They form a pair as any other yin and yang pair (such as for example fate/destiny vs free will). One of the axioms of yin-yang theory is that those two (yin and yang) always come in pairs, they are inseparable, one may be dominant but the other one is always there. For that reason I believe that any method we choose (coin method, yarrow stalk method or any other method) must have an element of randomness just to “immobilize” our ego/mind (yang) and unleash what I would call subconscious faculties (yin) which basically lead us to the answers however I would have REALLY hard time accepting that answers we get are totally random because that would imply that yin exists without yang which is not possible. 2) Statement “It is random, if it wasn’t you would always get the same anagram for the same question which is not the case” and “it is plausible the yarrow-stalk method (given the theory of the I Ching), indeed faithfuly represents and samples the event space” totally make sense and may very well be true however they sound an awful lot like a children of the scientific paradigm where repeatability (of an experiment) is the only valid proof of objective truth and existence of the phenomenon being investigated. As already stated Yi Jing is the book of CHANGES, expectations that we confirm validity of the given answer by drawing the same hexagram two (or more) times in a row comes from a different (scientific) “cognitive space”. Yes, “sample of events space” as nikosms put it does play a role, I would agree, however I must repeat my original statement – I do not believe one or the other sample of event space would critically affect efficacy of any given method. Why? because it is not all about randomness as I elaborated in the previous point. 3) Concept that one method may “more faithfully represent sample space” then any other given method leads us again to the same dilemma: are those methods themselves random (yin) or they are carefully and deliberately selected by someone (yang)? Again I think they are both at the same time but I think yang is dominant – they are not totally random methods. For example it is well know that ancient Chinese knew about magic squares (3×3 and others) and probability of 1/16, 3/16, 5/16, 7/16 in Yi Jing numerology can be seen as 1/7, 3/7, 5/7, 7/7 somehow “make more sense” to me than coin method probabilities and it is quite possible that what Nikosms said is true however one thing I know about Chinese people is that they are and they have always been pragmatic: if coin method was inferior to yarrowstalk method they would not use it for so long which leads me to believe it is not all about the method. And in conclusion I want to say this: although Yi Jing to most science-minded persons sounds like a pile of hocus-pocus nonsense Yi Jing is as scientific as it can get: ever since oracle bone times people asked important questions, oracle provided them with the answers and with the passage of times those answers were validated by the actual events. In other words everyone can test it: if you have an important question you are not sure about, ask the question, get the answer, wait, and see if the answer was correct or not. If answers you receive are nothing but random nonsense then don’t waste your time on Yi Jing. If however it turns out answers were highly insightful and useful and validated by the upcoming events then pay closer attention to it. Bug, or oddity, in the R code there: when you start off with 48 in the left hand & 1 in the right you still end up moving 4 from the right hand to the middle finger. Your calculation does, however, preserve the 5,5,5,9 pattern for the total between your fingers as you increment the no. straws in the left-hand division. Still, no-one divides the straws so unevenly, do they? This engenders the reflection that the uniform distribution given by sample(1:(48-hand),1) is unrealistic: owing to the patterns 5,5,5,9 at the first division, & 4,4,8,8 at subsequent divisions, the probability model you’ve shown, rather than exhibiting a “tiny bias” compared to the true model, might be seen as a reasonable approximation to a range of plausible models for how real people divide real bunches of straws. Or to put it another way, if the intent is, as you suggest, to obtain probabilities of 1/16, 3/16, 5/16, & 7/16, the yarrow-stalk method will be fairly robust to how different people divide different bunches of stalks; considering the exact probabilities when every possible division is assumed equally likely is something of a red herring. I love the dice explanations! Thank you for this article! Thanks for this explanation of the probabilities. I have been playing with the I Ching for thirty years and this was the m out complete and cogent discussion on the topic I have seen. One method not mentioned here was recommended to me because though it is two coin based, it claims to reproduce the same probabilities as the yarrow stalk method. (I will leave it to the more statistically minded to confirm that claim.) Don’t be thrown off by the 2-coins aspect, as it also requires twelve tosses, two per line. I believe you are correct Andy; they way you do it is a clever way to travel with two coins the probability tree that you can find in this post. A bit convoluted for my taste since you’re forced to do some calculations but, hey, it renders the correct yarrow stalk probabilities all right. Thank you very much for sharing! Your randomness theory fits well with ‘The Bicameral Mind’ by Julian Jaynes. It’s a while since I read it, but Jaynes suggests various forms of Divination (including the iChing) were taken seriously for thousands of years in all spheres of life in nearly every culture from Ancient Greece to China. The common thread seem to involve some random pattern that allows a ‘Eureka’ moment of creative interpretation that relates to whatever your particular problem is. The iChings answers are often vague or metaphorical, but your brain instantly applies them to your own situation. Similarly if you opened a Bible or Koran (or any significantly weighty text) while thinking of a current problem and pointed at a random stanza, your (bicameral) brain switches into gear to interpret it to your situation. I agree, the I Ching was clearly based on the yarrow stalks method. If you draw up a table with all probabilities for the changes of one old sign (three lines) to another, Earth will change to Heaven with 1/512, whereas Heaven will change to Earth with 27/512. This table will show much of the internal workings of the I Ching. Thanks, and congratulations for your work ! Hi Gus, yeah, I believe that somebody else hinted that if there is a higher power the method is not relevant for an individual since everything will be according to plan. However, even God has to follow Its own mathematical laws since, well, in a way they’re divine and, if this is the case, it does matter the method indeed, it truly does. About the translation into ‘watching in ambush’ you are literally right, but when I did the translation I took into account the context, that is why I wanted to remove the feeling of ‘trap’ that the word ambush and similar translations had and decided to leave the more open ‘waiting’ and yet, in my opinion, more precise in this case. However English is not my mother tongue so any word meaning “Waiting attentively in a non threatening way but rather compassionate” is more than welcome… I just thought that by placing ‘God’ and ‘waiting’ together people would understand the full meaning of ‘waiting’. Anyway, thanks for you comments Gus! After thinking about it a bit, it might be on purpose that the probabilities are skewed in the way they are, using the yarrow stalk method, but I suspect that they weren’t, given the mirrored nature of the descriptions of the different results and their associated values. For my own personal enjoyment and satisfaction, I figured out how to achieve the “proper” normal distribution using the yarrow stalks, instead of 1/16 vs 3/16ths issue as described above: When casting the first piece of a given line (where you end up with 5 or 9 stalks), instead of combining all of the stalks between your fingers, set aside the stalk between your ring and pinky fingers, and see if the two bundles left between your fingers have an equal number of stalks. If they do (2 & 2, or 4 & 4), they represent the number 9 and the value of 2. If they don’t match (1 & 3, 3 & 1), they represent the number 8 and the value of 3. Everything else works exactly the same. Thanks for writing this wonderful article! There it is at last! Thanks a lot! I’ve geen looking for this solution for a while. I’ve read that the current “classical” yarrow stalks method which gives unequal probabilities for old yin lines might as well differ from that of the first 1000 years of existence of the Yarrow divination. The current version was reinvented by Zhuxi of the Song Dynasty and it’s possible (from the analysis of Pre-Qin divination results) that the original method produced 6,7,8,9 probabilities very similar to the current coin method. But I like the process of stalks sorting and here I’ve found at last how I can use and get coins probabilites. (1) In describing the coins, you give “two heads” (8) as Young Yang and “two tails” (7) as Young Yin, when the odd numbers are usually taken as Yang and the even ones as Yin. It makes no difference to the argument, of course. (2) In a similar way, in the trigrams, though yang is the more masculine principle, the three daughters have two yang lines and one yin, whereas the three sons have two yin lines and one yang. More yang doesn’t always mean more action — there active daughters (Li) and still sons (Ken), as well as active sons (K’an and Chen) and more passive daughters (Tui and Sun). I am not sure why the word “descuido” translated as mistake in the poem is there? “LUZ”, which means LIGHT, and changes the meaning of this beautiful sentence in the poem to a much more enlightened meaning. Writing of the of book of time. Our life is a future and well-traveled road. Nothing abandons us. Nothing leaves us. You might discover a light, a tiny opening. But in the rifts, God is awaiting. Thank youforexplaining how the ratios are calculated.I understand now how the prime numbers came about. I knowof another way to make it easier without getting stalks. A simple deck of playing cards can give the same results, and offer up 2 small decks to use. Just remove 4 of one color of court cards, 10 of one color pips and 6 of the other color pip. That nets you a ratio of 2:32, 6:32, 10: 32 and 14: 32. Split them evenly and you cut the deck to 16 cards. To avoid getting the feel of them, and to keep them safe from friction wear, use the card sleeves sold in most hobby and game shops. I have a deck split into 3 small ones, but I had to tweek the definitions a bit to make up for the missing red court cards. I figure this is useful to add since most people have cards and it makes it feel more like a tarot reading for those interested in that without access to the expensive decks. I hope this helps, and thank you once again for the explanation. Really cool! Thanks for sharing Jon. Your second 4-coins method is a remarkably smart and straightforward method. Congrats and thanks for sharing! Maybe you should cut & paste it from your paper. I think nobody addressed it here because they are not going to the trouble of going to the link and reading the paper. Step 1: Toss 1 coin. Heads means strong, tails means weak. Leave the coin where you tossed it. Step 2: Toss 3 more coins next to the first one. If you see exactly 3 heads among all 4 coins, then the line is changing; otherwise unchanging. Have you considered that systematically tossing coins to exlpore purely mathematical outcomes might yield very different results than tossing them with a puer, authentic intention behind the toss? For example, I have observed that the various ying and yang energies within myself can influence what you call “randomness” outcomes. I have found that in the same way that intention can influence “coincidences” in everyday life, it can also influence coin tosses. With right concentration one can toss multiple heads or tails that consistently defy mathematical probability. If you deny this aspect of the I Ching, you deny its essence. It is not pure algorithm any more than it is pure intention. It is both. This is the essence of the Way. That is remarkable, I recommend you to present this ability to a group of reputable physicists and neuroscientists and publish a peered review paper together… It would be a landmark in the history of human kind. Very interesting, thank you. I’m just beginning with I Ching, and was looking for a really simple method when I ran into your article. I just realized that two four-sided dice (2d4) may be used in another way, hopefully easier to remember. Roll both dice and see what is the highest number. It’s so simple I’m afraid it’d be wrong. Wow, that’s pretty clever Rog! Thanks! By the way, you can get a relevant “non-random” reading, in sync with dream material, from the I Ching by setting in motion any three objects with two sides, e.g. three packets of tissues. Has anyone experimented with this? Hey excellent article I have studied the I Ching for some time and I have seen this same point raised in other places, but one of the comments raises another interesting point; there are non- numerical methods for creating a hexagram, and non-divinatory purposes for using it as well. The method of generating a hexagram is one aspect of the work but I would not call it an essential one. I find the system fascinating because it attempts to create a universal language of events and processes to deepen the vision of the practitioner and encourage associative thinking, while also emphasizing the universality of cyclical change. I hope everyone reading this is able to realize that benefit.